In the course of the IEE project EPISCOPE, the common typology scheme has been extended to additionally include showcase examples of new buildings meeting the national requirements or, as an alternative, more ambitious standards up to nearly zero-energy building (NZEB) level. 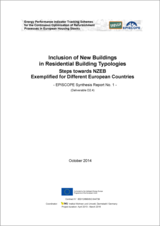 In the first synthesis report of the EPISCOPE project, the inclusion of these different energy performance levels for new buildings in national residential building typologies is described for each of the participating countries. Apart from the current national requirements for new buildings, the status of the national NZEB definition and the calculation method to comply with the building regulations are explained. For several countries no official definitions of nearly zero-energy buildings have been specified so far. In these cases, the considerations are based on an energy performance level that is assumed to comply with the NZEB approach. Furthermore, the classification schemes of national building typologies are displayed, and the integration of example buildings to demonstrate current national requirements for new buildings, an improved and the (assumed) NZEB standard is discussed and illustrated by the description of one example building from each country. For this example also the national building display sheet is shown which is included in the respective national typology brochures the project partners have elaborated. Results of energy balance calculations are shown with regards to the national calculation procedures as well as to the TABULA scheme. The latter has been evolved in the framework of the IEE funded project TABULA in order to make energy performance data comparable between different countries. It has been further developed in the framework of the EPISCOPE project and is now e.g. including the assessment of on-site electricity production by CHP and PV systems.